In recognition of her successful efforts to provide comprehensive addiction treatment in Atlantic County, the Walter Rand Institute for Public Affairs is honoring Jennifer Hansen as its Not-for-Profit Sector South Jerseyan of the Year. Jennifer’s dream to develop a much-needed addiction rehabilitation facility in Atlantic County came to fruition with the opening of the Hansen House, a twenty-nine bed halfway house for men in the fall of 2004. The following year, she opened another twenty-nine bed facility: The Hansen House for women. In 2007, Jennifer opened the Serenity House in Absecon to assist with additional phases of treatment and sober supportive living. In 2010, a second Serenity House was added in Pleasantville, and in 2011, The Randy Scarborough House for Men opened. 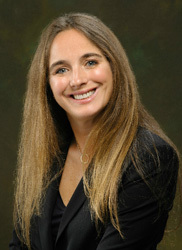 Jennifer is Founder and President of the Hansen House and oversees the management of all Serenity Houses. She also hosts two fundraisers annually to raise money for these organizations: Hendricks/Hansen Partnership for Recovery Annual Charity Golf Tournament and the Street Life Concert. Ms. Hansen grew up in Northfield, New Jersey, and attended the Williston Northampton Boarding School in Easthampton, Massachusetts before beginning college at Champlain College in Burlington, Vermont. She furthered her studies at Colorado State University in Fort Collins, Colorado and ultimately graduated from the Richard Stockton College of New Jersey in 1994 with a Bachelor of Arts degree in anthropology/sociology. Jennifer also completed Harvard University’s Owner President Manager (OPM) Key Executive Program and the Families in Business Program. Jennifer’s leisure interests include sailing, fishing, scuba diving, water skiing, snow skiing, golf, tennis, and travel. Jennifer resides in Margate, New Jersey with her husband Jon, daughter Mia and two sons, Jaden and Jackson. Page last updated by Senator Walter Rand Institute for Public Affairs at 9:04 am September 27, 2017 . This page was printed from http://rand.camden.rutgers.edu/2017/05/03/hansen-nfp/ at 4:07 PM Monday, April 22, 2019.